Located in the Ballantyne neighborhood of Charlotte, Camden Stonecrest offers one, two and three bedroom apartment homes with a coveted address in the top-rated Charlotte-Mecklenburg School District and only minutes from I-485. Each apartment home is packed with must-have features such as stainless steel appliances, custom cherry cabinetry, and washer and dryer. Not to mention extra touches including architectural columns, crown molding, bay windows, kitchen pantries and linen closets, walnut plank flooring, and upgraded lighting for a sophisticated look. Camden Stonecrest also features attached or detached garage options and we’re all about living green so take advantage of at-your-door trash and recycling pick up. Camden Stonecrest is also currently in process of becoming a completely non-smoking community. Our stellar amenities package includes outdoor and indoor amenities. Outdoor amenities include a saltwater pool with cabana and grilling lounge, picnic area and gazebo overlooking a pond, catch and release fishing pond with beautiful water fountain, playground, gated Dog Park with agility equipment and wash station and covered car care and maintenance center. Indoor amenities include a 24-hr fitness center with child play zone, theatre room with PS4, resident lounge with billiards and full kitchen available for private rental and resident business center and conference table. The Shops at Blakeney, Stonecrest, and Ballantyne Village are minutes away so you can enjoy the area’s best dining and shopping including Target, Ann Taylor and more. With all this, why would you live anywhere else? Come home to Camden Stonecrest. We welcome cats and dogs, up to two pets per apartment home with no weight limit restriction. Restricted breeds: American Pit Bull Terrier, American Staffordshire Terrier, Staffordshire Bull Terrier, Doberman, Chow, Rottweiler, any mix of the previous breeds, or any other dog or breed deemed aggressive. Get the perfect spot! 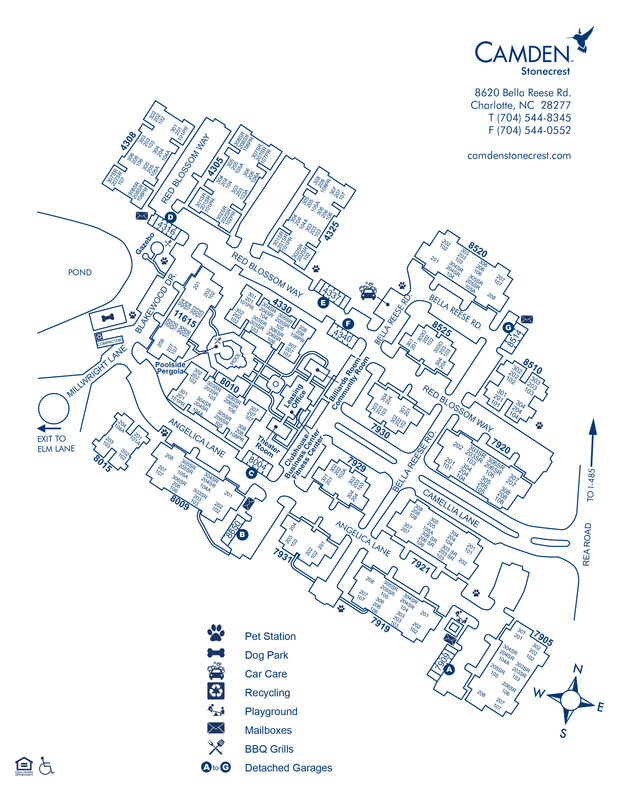 We have ample open parking for our residents and visitors on a first-come, first-served basis. Select apartment homes include attached garages. There are detached garages available to rent for $100 - $110 per month, based on garage size.